In 10-inch nonstick skillet, cook beef over medium-high heat 5 to 7 minutes, stirring occasionally, until thoroughly cooked. Drain; set aside. Add onion and bell pepper to skillet; cook 5 minutes or until tender. Stir in cooked beef, tomatoes, ketchup, chili powder, Worcestershire sauce, salt and pepper. Cook 2 minutes or until thoroughly heated. Spoon beef mixture onto buns. On top of each bun, place 2 olives to look like eyes; poke toothpick in center of each to hold in place. 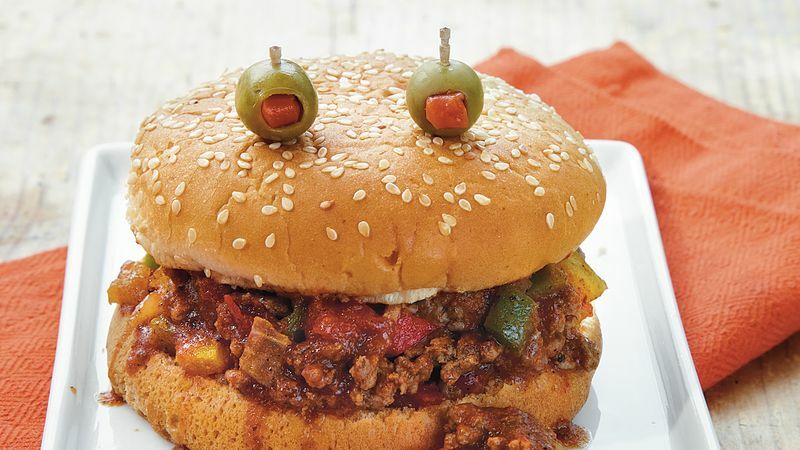 Make sloppy joe sliders by piling meat mixture onto miniature buns.